Last week, I shared some of my favorite chalkboard wall calendars. With school just around the corner, I’m looking for a way to manage oodles of schedules and thought a big wall calendar would be a great approach. For us, chalkboards aren’t ideal, so though I got a lot of inspiration from the choices I shared with you last week, none of those calendars will be finding their way into my office. This week, I have corkboards. 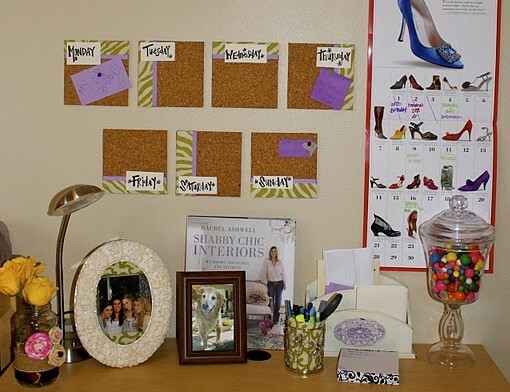 I happen to adore corkboards–they’re so easy to use, and can be decorated in so many different ways. And I was delighted to find so many attractive corkboard wall calendar options. Here are some of my favorites. 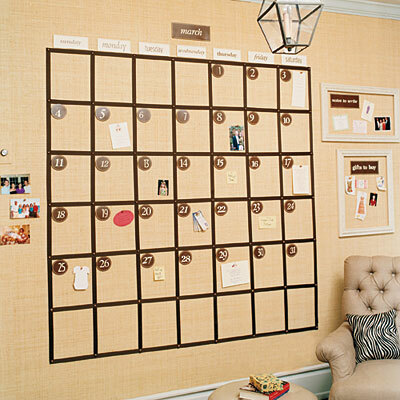 First up, we have a pretty standard corkboard calendar–it’s a great size, and I love the tip to adhere the dates with velcro so that each month the calendar is easy to set up. With something this large, I think I’d stick with a solid color as Southern Living has done, but I don’t think I’d use two neutrals–for my office space, a colored ribbon would infuse a nice jolt of color. If you only need to see a week at a time, Michaela made seven cute squares that might fill the bill. I like the way she switched up the positioning of the fabric on the squares to give it a bit more dimension without a lot of detail to distract from the week’s agenda. I love this checkerboard style command center. It looks like it was from Pottery Barn, but I can’t find it on their website now, so you’d probably have to DIY it. 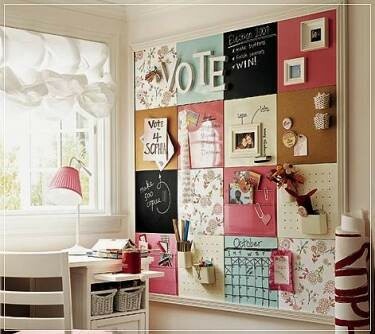 Their version includes white boards and chalkboard tiles, but I’d like it all in cork. 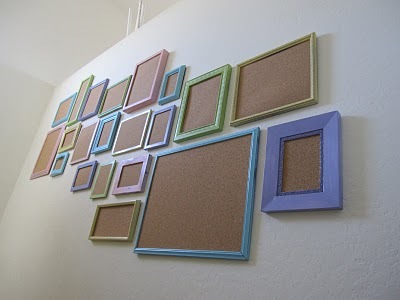 I love Shannon’s collection of framed corkboards and think it would make a great calendar system–you could even number the frames themselves which would save a little space and give each frame an extra decorative element. 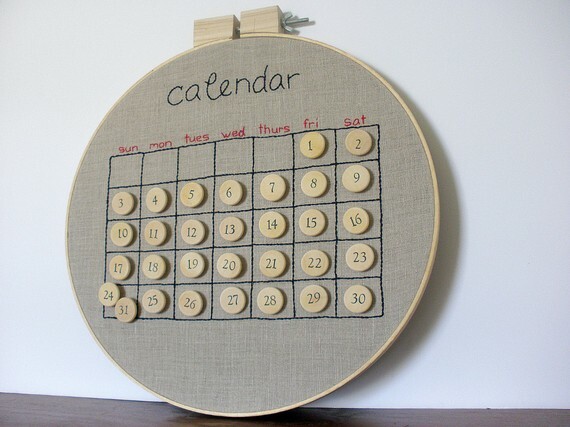 I love this embroidered perpetual calendar by Sara on Etsy. It’s hand embroidered on natural linen and has a piece of cork in the back so that you can pin and re-pin the numbers to date the calendar. I couldn’t resist including this one even though it doesn’t really have any space for weekly tasks. This gathering inspiration for my wall calendar has been so much fun. And I’m not done sharing just yet–stay tuned for one more roundup of fantastic wall calendars for home offices. Hi! I’m Jessica Zee, editor of GirlyPC. I’ve been working from a home office for nearly five years and in that time, home organization products have gotten a lot more attractive. But, unfortunately, the technology we're using... Hasn't. I’ve set out to change that in my own home office and wanted a place to talk all things pretty-home-office. Welcome to GirlyPC! Enjoy your visit. Copyright 2009-2011 GirlyPC. All Rights Reserved.